Christine's Rankings makes its triumphant return as the Formula One circus starts to rumble into action once again. With the Belgian Grand Prix now just days away, and all of the summer break pretty much behind us, the drivers are well rested and ready to get back into action. That means lots of points waiting to be nabbed as the second half of the rankings championship gets underway. This week we have a promotional video from Lewis Hamilton, and the Red Bull duo duelling with words. There's also plenty of domestication from our drivers, with cooking and laundry, as well as perusing the old photo albums. +2 Max Chilton: Preparing to take part in the Goodwood Revival, historic racing ahoy. +2 Kamui Kobayashi: Some rather excellent cooking going on here, particularly in such large quantities. +1 Nico Hülkenberg: Getting stuck in with some holiday chores even if it is in paradise. +2 Max Chilton: Undertaking the Best Man duties at his brother's wedding, which includes a pre-race photo. +1 Sergio Pérez: Showing off his rather disturbingly thick neck after training. +2 Jean-Éric Vergne: Handling a mid-season message of upcoming redundancy quite well. +2 Daniel Ricciardo: Dissolving into giggles after the Belgium word association game with Sebastian Vettel - particularly enjoying his pronunciation of Spa-Francorchamps. 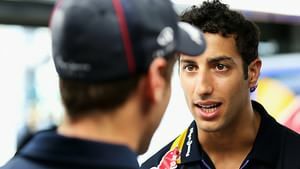 +2 Sebastian Vettel: Trying to be a stickler for the rules during the Belgium word association game with Daniel Ricciardo, but ending up joining in regardless. +2 Nico Rosberg: Delving into the archives for this picture of some mud-buggying, which is gross but hey, I guess it's fun for race drivers! +7 Lewis Hamilton: An excellent in-car interview, in which James Corden asks the questions as he is taken on a flying lap of Rockingham.